VMR-HD4D-8 Series Switched, Metered PDUs series are designed to deliver redundant, controlled power to Cisco Catalyst 9400 LAN switches and other high amp devices. In the event that your Cisco Catalyst 9400 requires a hard boot after locking up or reset, you can remotely reboot or cycle power to all power supplies from anywhere! In the example at the right, the VMR's eight switched IEC C-19 outlets are used to provide redundant, remote power control for a Cisco Catalyst 9400. In addition to controlling power, the VMR-HD4D-8 can also measure power consumed by the switch, and report results via web GUI, data export or polling. Note: When selecting a VMR unit for your remote power management application, make certain to take into account the number of power supplies present on the managed device, the total current that the managed device will draw and the level of activity that the managed device will be required to support. 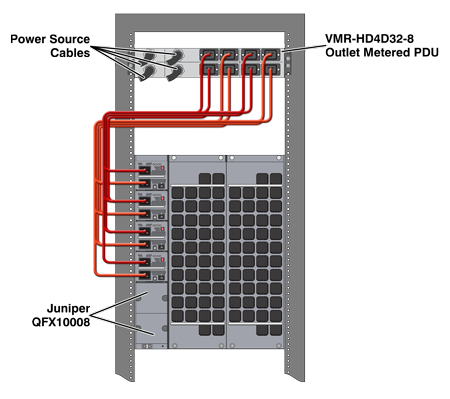 VMR-HD4D-8 Series Metered Switched PDUs feature four 30 Amp or 32 Amp power inlets, eight IEC C19 outlets and eight 16 Amp or 20 Amp UL-489 circuit breakers. Each circuit breaker protects one IEC C19 outlet and will support up to 20 Amps. The VMR-HD4D-8 is ideal for remote power control and management of Cisco Catalyst LAN Switches, Cisco Data Center Switches, HP Enterprise BladeSystem units, Juniper QFX10000 Series modular Ethernet switches and other high-amp equipment. Advanced power metering capabilities allow the VMR-HD4D-8 to measure and report Kilowatt Hours, Kilowatts, Amps, Voltage and Temperature. When any of these factors exceed threshold values, the VMR can switch or reboot power and promptly send notification. In addition to its many alarm functions, the VMR can also perform remote reboots and power shutdowns on individual outlets according to a user-defined schedule, when a ping command fails or on demand. Energy consumption data from your IT equipment can be individually assessed at each VMR outlet and used for billing, heat calculation and load distribution. The VMR's intelligent, feature-rich design allows you to meter, report and control total current, power and energy consumption in your rack, cabinet or remote site. This provides the perfect solution for data centers striving for reduced energy costs and LEED certification. 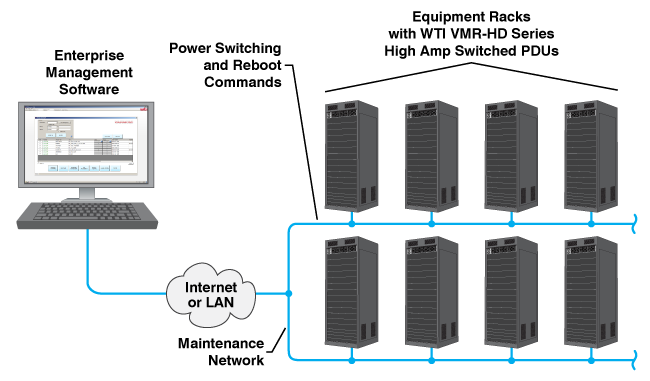 The VMR can be configured and operated via its convenient IP web browser interface or by any SNMP MIB based enterprise management software. To see a complete list of approved management software, or to recommend additional software or compatibility testing, please see our Software Integration section. The VMR-HD4D-8 is the perfect tool for controlling 200 to 240V AC power to a Hewlett Packard Enterprise C7000 BladeSystem Server. 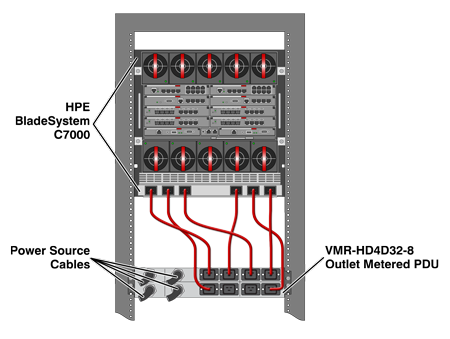 The VMR includes four separate power buses; this makes the VMR particularly well suited for devices such as the HPE C7000 that require power supply redundancy. Each circuit includes two switched IEC C19 outlets, for a total of eight outlets (one outlet per breaker, two breakers per bus.) The VMR-HD4D-8 can also remotely reboot or power down the HPE C7000 BladeSystem, monitor power consumption, temperature and other factors, and generate alarm notification when critical events are detected. The VMR-HD4D-8 is well suited for controlling power and reboot functions for Juniper QFX10008 Core Switches. In addition to power control and reboot functions, the VMR-HD4D-8 also provides the ability to meter energy use by the Juniper QFX10008 and report findings in text or graph format; a very valuable tool for those who need to track power use and energy costs. 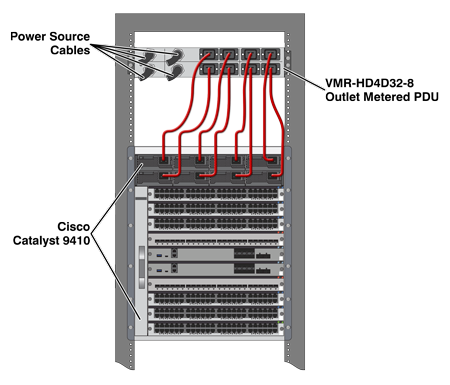 The VMR's eight switched, IEC C-19 outlets allow remote power control for the Juniper QFX10008. In order to simplify the task of managing multiple power reboot units spread throughout a large network infrastructure, all VMR series high amp metered PDUs include WTI’s innovative Enterprise Management Software. The Enterprise Management Software provides a centralized command interface that can be used to manage, label and control multiple VMR units in large network applications, drastically cutting the time required to locate specific units in order to reboot attached devices. The Enterprise Management Software can search a user-defined IP Address range and discover and recognize all WTI devices within the range. Once units have been discovered, they are added to the Enterprise Management Software’s inventory list and a descriptive tag can be assigned to each unit to denote the location or function of the device. In addition to providing a centralized interface for controlling power switching and reboot functions, the Enterprise Management Software can also be used to control firmware updates for compatible WTI products and edit and manage user accounts at individual or multiple VMR units.